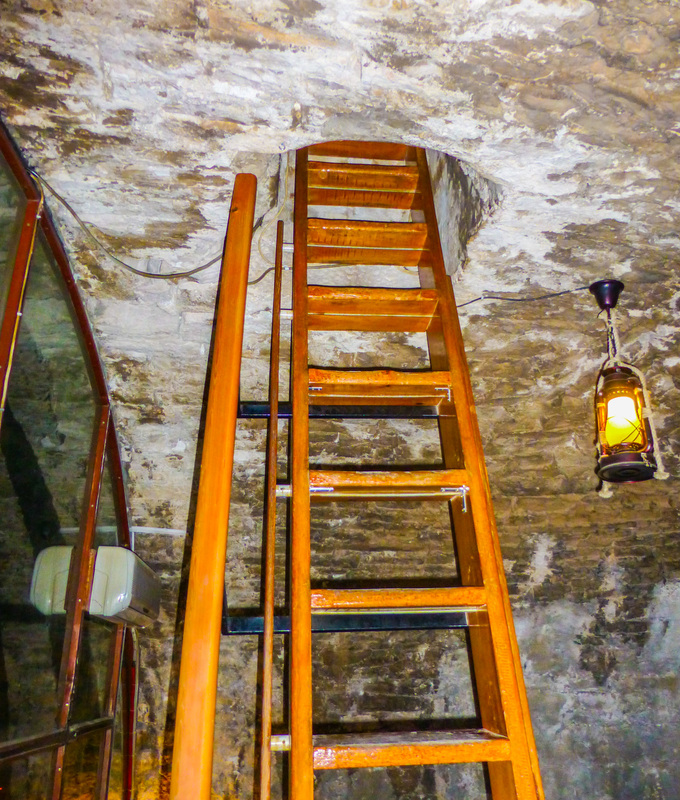 Climbing a ladder to get a cocktail may be my favorite way to drink…at least if I’m at Massimo Cocktail Bar on the island of Korcula, Croatia. The drinks are fruity, the view amazing, and the experience unforgettable thanks to its location in an ancient tower. Massimo Cocktail Bar is located at the top of Zakerjan Tower overlooking the Adriatic Sea’s Peljesac Channel. 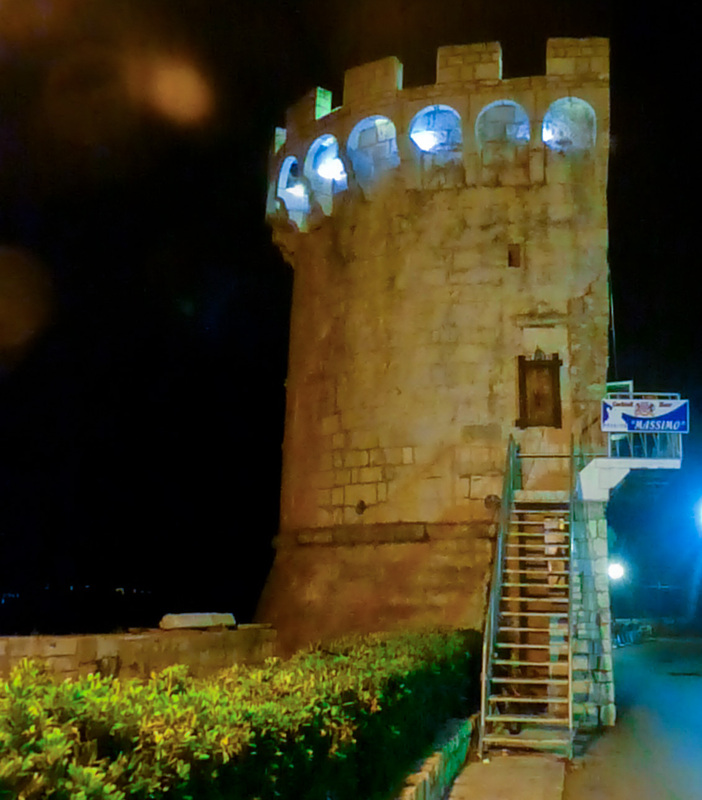 Zakerjan Tower was built in the late 15th century and has a medieval architectural look to it. Though Massimo Cocktail Bar has a bar on the lower level that you need only climb stairs to get to, the real fun is up top where you’ll find an open air setting punctuated by the turret design of the edge. Sipping drinks on top of the tower by the ladder entrance. 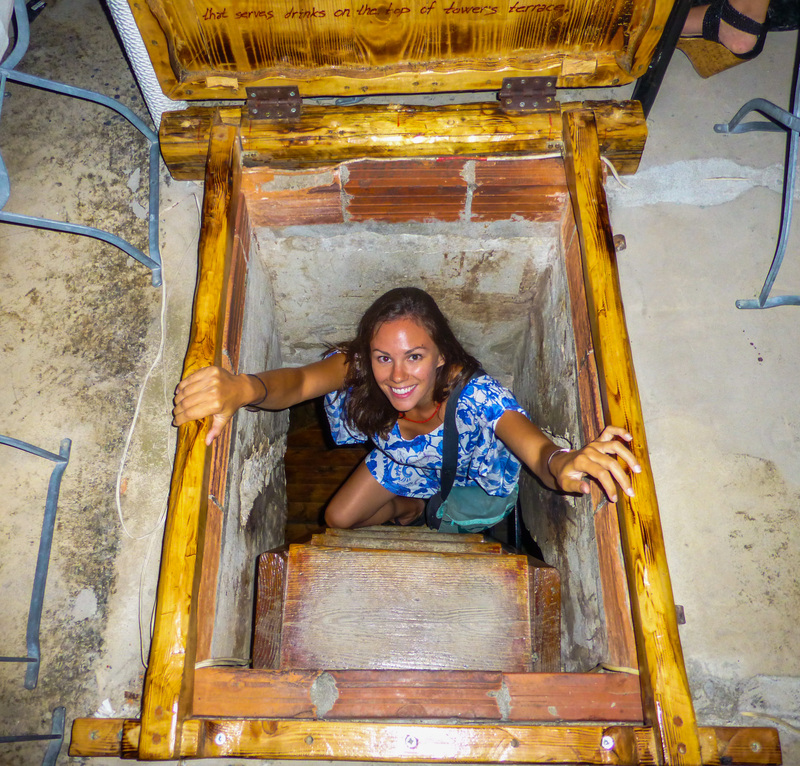 That’s because the only way to get up there is via a simple wooden ladder with wide-spaced rungs that I had to cling to carefully as I made my way through the hole in the ceiling to ascend into the summer night island air. Ladder from the lower level to the upper level of Massimo Cocktail Bar. Any climbing up the ladder. Fun sister times at Massimo were about to be had. The drink list consists of cocktails with silly names like the Pinky Colada, a twist on the Pina Colada thanks to grenadine added. While these are likely not going to be the best cocktails you’ve ever had, they’re still tasty and when you’re sipping them while enjoying views of the landscape or twinkling lights in the distance and the salty breeze, they taste even better. Yummy, fruit cocktails — I loved the colorful straws! I had the Njam, Njam which was made with peach vodka, apricot, strawberry juice and topped with whipped cream. How do the drinks of Massimo Cocktail Bar get up the tower? The bar to mix the drinks at Cocktail Bar Massimo is actually downstairs. Before visions of servers and drinks tumbling down the ladder dance through your head, don’t worry – the drinks aren’t brought up via the ladder. A pulley system on the side of the tower delivers drinks. Instead, the servers use an ingenious pulley system to transfer drinks in a basket from the lower level to the top of the tower. Once at the top, the drinks are transferred to a tray and served to the tables. Drinks just brought up by the pulley about to be delivered to tables. Despite only seeing a glimmer of the ocean where light hit it and not being able to see the lush green hillside of the island where it wraps around the bay, we still had a marvelous time visiting Massimo Cocktail Bar. Twinkling lights in the distance. 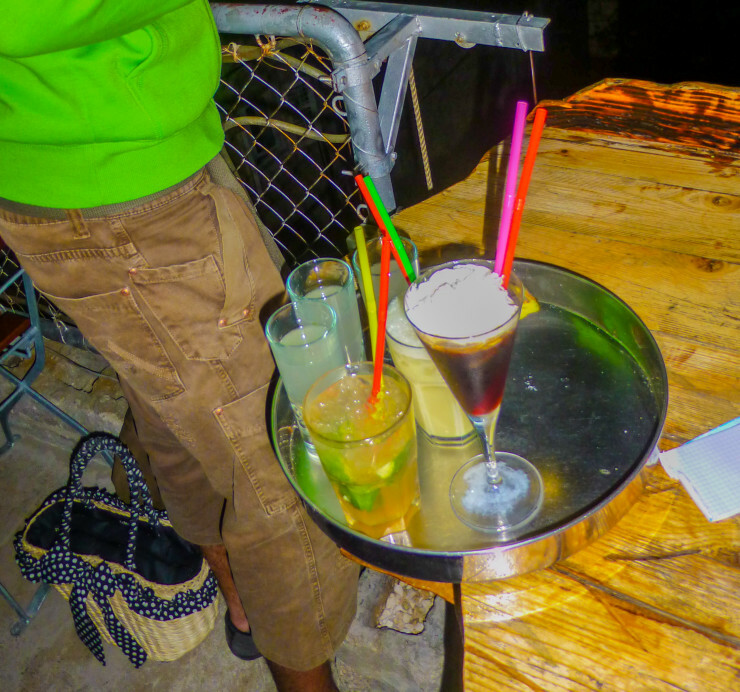 Massimo Cocktail Bar is located at Kula Zakerjan off of Šetalište Petra Kanavelića (located at the tip of Old Town Korcula) and is hard to miss. 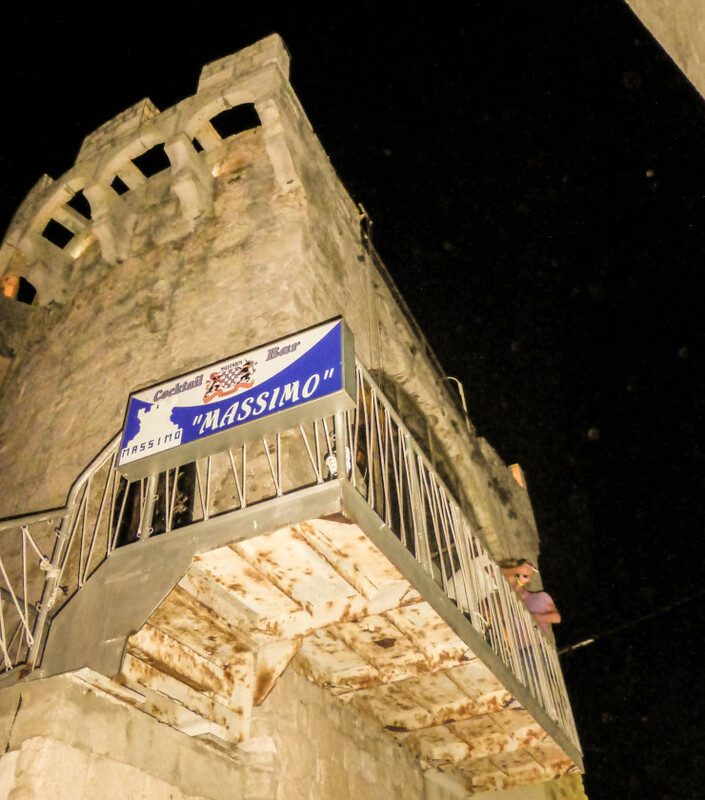 Just look for the half circled tower by the water with the blue sign Massimo.